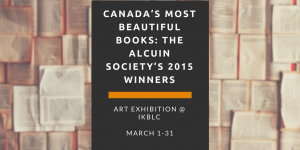 Every Spring since 1981, Vancouver’s Alcuin Society holds a national competition to select the country’s most beautiful books of the previous year. 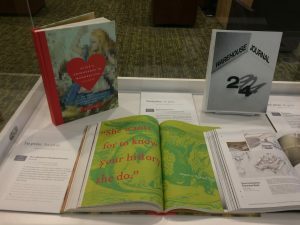 The winning books tour every province in Canada, and are also exhibited at the two major book fairs in Germany, in Frankfurt and Leipzig. 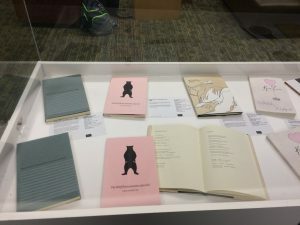 As well, copies are donated to the Canadian Embassy Library in Tokyo, where they are exhibited during the Tokyo International Book Fair. The purpose of the competition is to motivate publishers to pay attention to the look of books, as well as to their content. 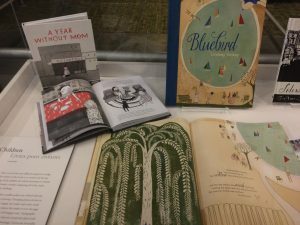 In addition, the Society hopes to encourage book designers by national and international recognition of their work. The books are judged by three different jurors each year – experts in their fields from all over the country, and, occasionally, from abroad. The entire book is taken into account: the cover, the choice of type, layout, white space; paper used, readibility, creativity in design; and most of all, the appropriateness of the design to the content. This March, IKBLC is exhibiting the winners from last year’s competition. There are eight categories of books: from children’s books to pictorial, from poetry to reference. Some of the judges’ comments on what they liked about the books are available, and displayed near the books. PDFs of the full-colour awards catalogues are available online for some of the past competition winners. In mid-March 2017, the Society’s 35th competition will take place in Vancouver, for Canada’s 2016 publications, and when it’s published, this year’s catalogue will be available online as well. This exhibit takes place March 1 to 31, at the Irving K. Barber Learning Centre (2nd level).